The following sermon was preached by Dr Wilhelm Torgerson in the seminary’s Martin Luther Chapel on Easter Wednesday, 2012. Did you hear about it? During excavations in Jerusalem a parchment was found, apparently containing a confession by the Apostle Peter. In it he remorsefully admits that in that fateful year 33 A.D., during the night from Saturday to Sunday, he secretly entered the tomb, took the body of Jesus and hid it in a cave just outside the city. The parchment stated: I just couldn’t accept that our Master was now dead; so I just started talking about his having risen from the dead. And then Peter even described the cave where he hid the corpse of Jesus. The archeologists went looking, and lo and behold, they found human remains from about 2000 years ago. Of course, after that discovery there wasn’t one newspaper that did not head-line the story on the front page: “Christianity Disproven”, you could read. Another headline blasted: “The First Pope a Deceiver—Jesus Never Rose from the Dead”. Understandably there was some alarm in pious Christian circles, but some of the major Protestant representatives couldn’t wipe the smugness off their faces: “This is perfect to shut up the fundamentalist and put them in their place.” Had not real theologians taught at the seminaries for years that the message of Jesus’ resurrection is: Don’t give up on life, we’ll continue living in the thoughts of our loved ones. Jesus’ message will go on: love for the neighbour, world relief, environmental protection and good concerts—if you’re into Palestrina and Bach. Whether they found his remains or not, we continue doing what we’ve done throughout the 20th century, so nothing need change in our churches. And we certainly will celebrate Easter as we always did. Calm down, you poultry farmers in Canada, the kids can keep looking for the eggs on Easter morning, and the chocolate industry of Switzerland can still sell their chocolate bunnies. My Brothers and Sisters! Did you hear about it? Well, you couldn’t have, because I made it up. No one in Israel found that cave or the remains of Jesus. And instead of writing remorseful statements, the Apostle Peter let himself be crucified almost like his Lord; with his life and death he showed that he was willing to testify to the truth of Jesus’ resurrection. You may well ask, why such a crazy story to begin with? No, not to shock you, not to sow the seeds of doubt in your mind about the resurrection. On the contrary. I did this because the Apostle Paul, in the text we just heard, does something quite similar. He confronts the Christians in Corinth with arguments similar to what I did. Not because Paul was a prankster looking to attract his readers attention with a catchy story. Rather he had a good reason for the argumentation he engages in, for in the Corinthian congregation there were apparently some who did not believe that having died you could be alive again; once you’re dead, you’re dead; period. Fact is, the message of the resurrection of the dead, indeed, of the body, of the flesh, this did not fit at all into the mindset of the people in Greece at that time. Yes, to be sure, that man had an immortal soul—of course! And that his soul was liberated from the body at man’s death—admittedly! But that a body, put into the ground to decay or burned to ashes on the pyre, that such a body should rise again, and in better condition than ever before—well, pardon me, that’s simply ridiculous. There are those around us, perhaps even many, who accept that there is such a thing as a spiritual survival after death, someone remembering the life we led or the accomplishments we achieved—but a bodily resurrection? What a child-like, no, what a childish thought. Which highly educated, philosophically trained Greek would fall for that one—or what Canadian or American or German? And yet there seem to have been members of the congregation in Corinth who thought so. They may even have accepted the fact that some years back, over there in Jerusalem, this Jesus of Nazareth actually rose from the dead. But what did that have anything to do with the people here in southern Greece? It is to this kind of thinking that the Apostle Paul responds in I Corinthians, chapter 15. If you think, so his argument goes, that the resurrection of Christ was a private event in the life of this man Jesus over there in Palestine, and that this has about as much significance for us today as when a sack of rice falls down in China, then you have no clue about what really happened that Easter morning and what it’s real significance is. The resurrection of Christ is not something for the circus like a collection of oddities and curiosities. It is nothing less than the beginning of the resurrection of all the dead which God has promised for the end times. Once the resurrection of the dead has started with this, the first one, there is no stopping it for the rest, they will surely follow, eventually even here in St. Catharines. Or negatively: If you deny that you will be raised from the dead, then you are in fact doubting that this initial, this original resurrection has really taken place or that Jesus is now alive. And then the Apostle engages in a series of arguments about what it would mean if Jesus had in fact not been raised from the dead, if his bones were still in an anonymous cave either rotting away or being excavated 2000 years later. If that were the case, Paul argues, then you might as well forget all about this worship service; then you could have stayed home without having to listen to a long sermon this morning. A sermon not based on the fact that Jesus is truly and really risen, that sermon is empty hogwash that you do not need. It would be a meaning less rhetorical exercise. What indeed should we talk about in this place if Jesus is in reality dead as a doornail? Should we recall those wise sayings of his that someone has recorded? You can forget those if he’s just as dead as all of us will be in the end. Or should we just learn from him to be nice to each other? That wouldn’t be wrong, but would you need the church for that? Let’s face it: if Christ is not risen from the dead, from his death, then your faith is an empty shell and there is really no reason to be a Christian. We do not need a religious cult for the dead! And by the way, you theologians and professors, whoever denies that Jesus truly rose, he has to charge the apostles and all the others who testified to his resurrection that either they smoked pot once too often—or that they were outright liars. But that the apostles were themselves deeply convinced that they had seen him, their risen Lord, not even the most critical historian can reasonably deny. Paul, the author of our text and this letter, says that the risen Lord appeared to him personally—and completely changed his life. Let no one tell me that Paul, the persecutor of Christians, because of his burning desire to see his beloved Jesus at least one more time, just made up this story and composed an intricate theological system or founded a new religion. Some say just that—none have ever reasonable evidence. And that isn’t all: If Jesus did not rise from the dead, if he is still dead like all the others that preceded him, then God did not accept his life or his message or his death as the fulfilment of the promises he had made so long ago; then God did not offer him up on the cross as a propitiation for the sins of the world. Now I’ll admit, that if you don’t believe in God in the first place, that won’t mean much; but we’re talking about Christians, aren’t we? He who believes in God and yet does not trust him to have raised Jesus from the grave, he has a real problem. Christ’s death on the cross won’t mean a thing to him, and he’ll have to minimize man’s depravity, our own sinfulness and turn them into merely a series of peccadilloes that are part of human nature; ah, God will just pass over them in silence. Without Christ’s resurrection we could have disregarded Good Friday and its services, for at the end of his life Jesus just seems to have had bad luck. How much better it would have been for him to live a few more years and continue to say some interesting things and work some nifty wonders—none of which would get us into heaven. And Paul continues: If Jesus was not raised from the dead, forget about all Christian funerals! What are we to say at the grave of one of our loved ones? That he or she continues living in our hearts? That he still exists as an immortal soul somehow, somewhere, maybe even looking for a rebirth in another creature? Then we should quit proclaiming the Gospel at Christian funerals and let secular, well-trained orators give a speech about how man in general, and the deceased in particular, was basically a decent bloke; too bad he’s gone from us. For that you don’t need the church or the Christian faith. The funeral may be as beautiful as possible—some of them do at times look like horticultural exhibits—but if there is no proclamation based on the reality of the resurrection, it will be hopeless gibberish that does not take the hardness of death seriously. And Paul continues: If Christ was not raised, than it would be less than smart, in fact downright stupid, to continue being a Christian. I’m not a Christian because that gives me a discount in the department store; or because I can join fellow parishioners for morning breakfast or go on the occasional pleasure cruise. If you’re serious about being a Christian, then indeed there is a price to pay; then you cannot participate with everyone in everything; then you’ll have to say no at times when others, often the majority, say yes. If Christ was not raised, then you must be kind of daft to get up early on Sunday morning (except maybe to go fishing); or to let others laugh at you about your faith, even risking dissension in your own family. If Christ was not raised, then all those uncounted Christians must simply have been dumb who at this hour are pining in gaols and concentration camps; or who have to sneak about to attend a worship service secretly, fully aware that they are putting themselves at risk of arrest, imprisonment or even death if they’re caught. If Christ is not raised, then only one rule is valid for our lives, writes St. Paul following our text in v. 32: “If the dead are not raised, ‘Let us eat and drink, for tomorrow we die’.” Let’s have fun, life as one big party! Life after 30—and you’re ready for the old folks home. No, my Sisters and Brothers, the message of Christ’s resurrection is not just an insignificant detail of our faith, a doctrinal statement about which opinions may differ and on which every pastor can proclaim his own personal view. Whoever denies the resurrection is in fact upending the foundation of the Christian faith; he will have nothing left but a bit of self-made religiosity. But enough with this kind of speculation, what if! What if he wasn’t raised? Fact is, it is no longer an open question. It was answered that early Sunday morning when the women came to the empty grave; it was answered when Jesus came into the midst of his disciples that Easter evening; it was answered when Christ himself sent his disciples into all the world to preach the Gospel to every creature; and it was answered when he knocked Paul down from his high horse before the walls of Damascus. Therefore it is good to be at this worship service. Listen to the sermon—not because it is expertly crafted or rhetorical fireworks—but because Christ our Lord is speaking to you here and in it proves himself to be your risen Lord. And it makes sense to come to holy communion because it’s not merely a pious remembrance of some great person of the past. Rather our Lord, risen from the grave, comes to us with his true body and blood, to forgive our sins and to strengthen our faith. And I will add: If Jesus had not risen, then we could, indeed should dispense with this celebration, because it would be utterly devoid of meaning. 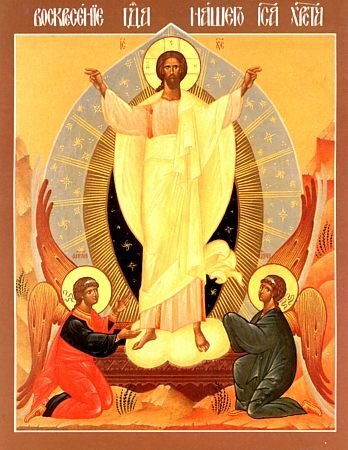 But precisely because he is risen we will in his holy meal receive our part in the life of the resurrection. The church father St. Irenaeus aptly called it “the medicine of immortality”. And because Christ is risen, at funerals we don’t just need to talk about what a great person the deceased was—which he or she may have been—but we can bid farewell, temporarily, to a brother or sister, consoled by the certainty that they, having believed in Christ, will be raised by him to life eternal. Who else but Christians can say that in the cemetery?